Explore the five new themes – Identities, Experiences, Human Ingenuity, Social Organisation and Sharing the Planet – with this clearly-structured coursebook. 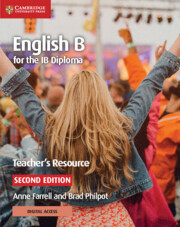 With over 50 per cent new content, lots of text handling exercises and more than 15 audio handling exercises for listening practice, this book helps students tackle the updated English B for the IB Diploma syllabus. Sample exam material, new content for SL and HL oral assessments and references to online videos provide opportunities for students to develop their skills. 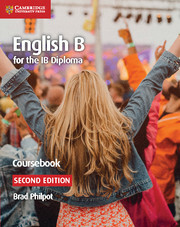 Answers to coursebook questions are in the teacher’s resource and audio for the listening practice is online. A popular introduction to the course outlines syllabus structure and assessment in a clear way.